Punches the target, dealing 394 Mechanical damage. Enters repair mode, performing no actions for two rounds, then repairs 1379 health. Deals 236 Elemental damage instantly. The enemy Burns for 98 additional Elemental damage per round for 4 rounds. Quake is powerful, especially against back-line Beasts (i.e., the Darkmoon Faire Tamers). However, while Personal World Destroyer can do the devastating Quake-Repair-Quake sequence, Pocket Reaver has Quake and Repair in the same slot, which in my view renders this pet much weaker. So very pleased I got this guy on the second attempt! I went to Tempest Keep for 2 reasons. 1. I needed a sword for mogging. And 2. I wanted this pet. Its my luck that the little guy dropped the first time i was very suprised. Since then i have obtained another one. This is a very unique pet that people should definitely add to their collection if they collect! Also be for warned. The boss will silence you nearly the whole time your in the fight. But if your lvl 90 you should have absolutely no problems at all. Got mine today on my second week of TK. Quake sounds so OP, cant wait to lvl this guy up. Boss can be a pain with his silance ability but other then that should be no problem. Got mine on my first trip through. Since I love Robotic Pets the most, I am going to level this bad boy immediately. If you don't know where he is in Tempest Keep, The Boss is off to the left when entering the Raid. Easiest boss for Feral Kitty. First go today, makes it easier since i have 11 alts at 85+ means I can now skip a boss. 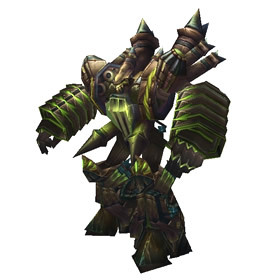 Sent through the Twisting Nether by the great Archimonde the Defiler to terrorize tiny civilizations with their medium-sized stomping noises.